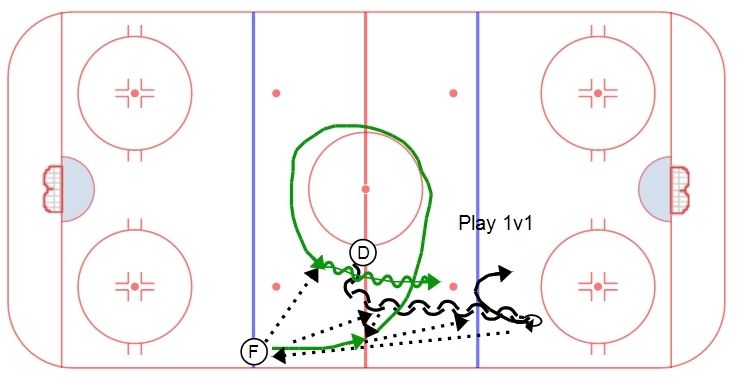 A dual action 1v1 drill. Starts with forwards on opposite blue lines and D at the red line on the circle. On the whistle, a D takes off backwards, exchanging with the forward skating towards him. When the D gets inside the blue line, he escapes towards the boards and fires a hard pass up to the line where the Forward came from. The F that was passing with the D then skates hard around the center circle and receives the puck from the line he came from. He then attacks the D 1v1. Forwards need to focus on their accelearation with and without the puck. Also they want to try to attack the D while he is in transition – put him in a tough situation where you can make him vulnerable. Defensemen should focus on their ability to skate backwards and exchanging a puck, a nice tight escape and a hard pass to the line. They should then really focus on getting up and gapping to the play quickly and effectively. A good stick against the rush (keeping the forward to the outside) and going stick to puck on the shot are critical.